The reincarnation of the Dalai Lama must “comply with Chinese laws,” the Chinese Communist Party government has said as the Tibetan spiritual leader recovers in hospital from a chest infection. 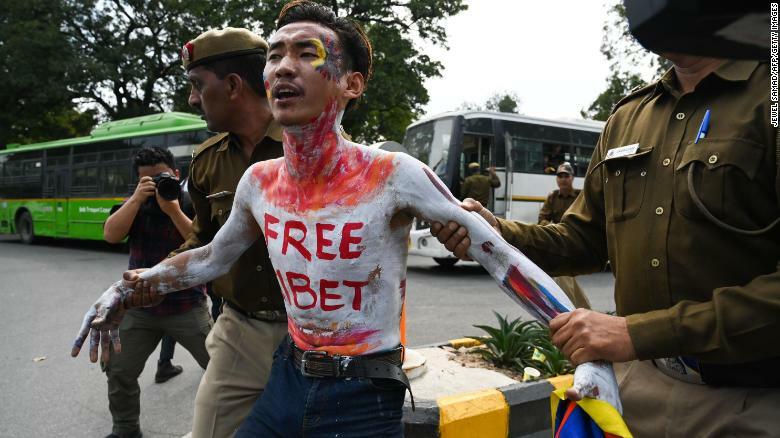 A Tibetan exile activist is detained by Indian police during a protest to commemorate the anniversary of the 1959 Tibetan uprising against Chinese rule, near the Chinese embassy in New Delhi on March 12, 2019. It isn’t completely clear whether the Dalai Lama will allow himself to be reincarnated after he dies. The Tibetan spiritual leader has hinted in recent years that he might be the last person to hold the title. Tibetan reincarnation expert Ruth Gamble, at La Trobe University’s China Studies Research Center, said there was no requirement for the next Dalai Lama to be born in Tibet. “They say they are waiting for my death and will recognize a 15th Dalai Lama of their choice. It is clear from their recent rules and regulations and subsequent declarations that they have a detailed strategy to deceive Tibetans,” he said. The leader of Tibetan Buddhism said in his statement he would consult with his fellow monks when he was “about 90” on whether the institution of Dalai Lama should continue. The Dalai Lama’s fears of interference by Beijing in the reincarnation process are not without precedent. In the 1990s, a process to find the reincarnation of the 11th Panchen Lama, another important religious leader in Tibetan Buddhism, ended in division and controversy after the Dalai Lama’s chosen candidate disappeared and a successor selected by the Chinese government was put in his place. “In some ways, it’s not really his choice. If people go looking for him, they’ll find him,” she said. The most likely outcome was for two Dalai Lamas to emerge after the 14th holder of the title passes away, Gamble said — one picked by the Tibetans-in-exile and one selected by Beijing.